For a recent artistic endeavor, local glass artist Travis Rohrbaugh found inspiration in his favorite beer. When searching for a historical artifact to recreate for the Pittsburgh Glass Center’s “Out of the Archives and Into the Gallery” exhibition, Rohrbaugh found a centuries-old Egyptian alabastron, which he said bore an uncanny resemblance to a modern-day beer bottle. “We had gotten a case of Labatt Blue, and those were the bottles that came in the case and I was like, this color — this is so pretty. I have to keep this and do something with it,” he said. 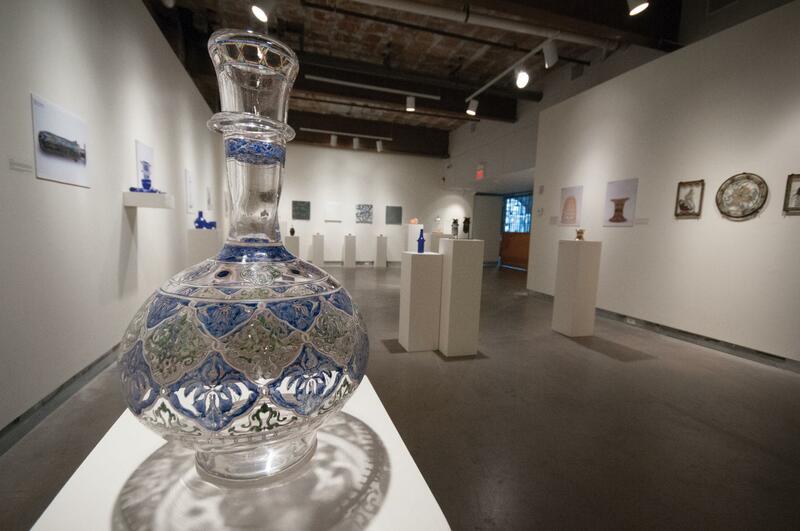 Last Friday, the Pittsburgh Glass Center, located in the Friendship/Garfield area, debuted “Out of the Archives and Into the Gallery,” an exhibition featuring modern interpretations of ancient glass artwork, as well as recreations of centuries-old tools and everyday objects. The display will run until Sept. 13. The exhibition is a joint effort between Heather McElwee, the Center’s executive director, and Deborah G. Harding, the anthropology collection manager at the Carnegie Museum of Natural History. The pair met during an earlier collaboration between the two institutions, when the Glass Center borrowed glass biological models for an exhibition called “Lifeforms” in 2013. During the “Lifeforms” partnership, Harding showed McElwee a sampling of glass-made relics from the Museum’s 100,000 ethnological and historical specimens and 1.5 million archaeological artifacts. These pieces ranged from sixth–century Palestinian lamps to glass cups from the Roman Empire. These pieces were not on public display at the museum. McElwee and Harding kicked around the idea for an exhibit until December 2014, when they reached out to 15 local glass artists and asked them to choose an object to rework in advance of the June opening. After picking their relics, the artists were on their own to research, reimagine and reconstruct whatever objects they chose. Glass artist and Pittsburgh native Dana Laskowski, who’s been involved with the Glass Center since she attended the Creative and Performing Arts School located Downtown in the mid-2000s, was initially overwhelmed by the challenge. When she visited the archives, Laskowski picked out a series of medieval panels featuring cartoonish drawings of rabbits, but found more material than she anticipated while sifting through feudal British manuscripts. “It was a contrived effort to use all of that information, and then I realized, well, I’m going to use what they were inspired by, to be inspired,” Laskowski said. Eventually, Laskowski combined her research with her own creative twist on the panels by magnifying the size of the images and adding floral and snake-like borders to each piece. The final product – a series of bunny-centric sequences – includes “Let Me Help You,” which shows a rabbit mauling a small child, and “Uh-Oh,” a depiction of a rabbit jousting with a dog. While artists such as Laskowski and Rohrbaugh focused on their subjects’ strange images and historical implications, other artists developed personal connections with their artifacts. Sharvin decided to create “Janus Flasks,” which were perfume bottles molded in the likeness of Janus, the Roman god of beginnings and transitions. Like Laskowski, Sharvin initially admired the flasks because of their appearance. But as he studied Janus, he noticed the parallels between the deity’s role in Roman culture and his own situation — Sharvin recently moved back to his hometown of Columbus, Ohio, and is now deciding between different career paths in the art industry. “It really, really rang home, like directly with what was happening in my life,” he said. Sharvin’s newfound relationship with his work motivated him to mold three clear glass bottles for the exhibit, each of which has a tiny open door inside to indicate the possibilities of a new phase in his life. He illustrated the outside of each bottle with a design that reflects his personal interests — for example, “Hoh River” is wrapped with a map of Olympic National Park, his favorite backpacking spot. For Sharvin, representing personal experiences in this way ultimately betters the experience for both the artist and the viewers.